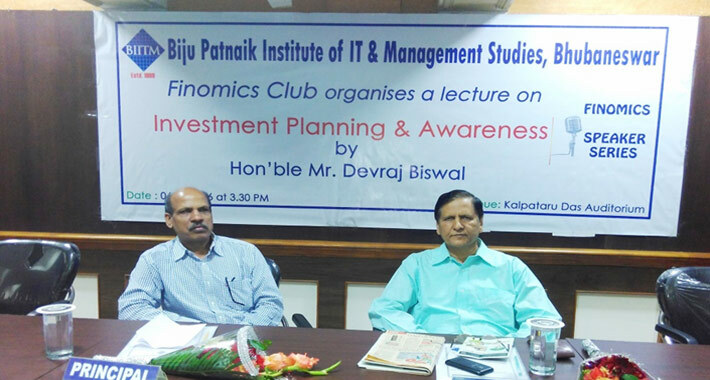 The FINANCE CLUB of BIITM, a front-line business school of Bhubaneswar, was inaugurated on 06.02.2016 by Mr. Devraj Biswal, Ex-CEO of Bhubaneswar Stock Exchange. A warm welcome was given to the dignitaries by the members of the Finance Club. A hymn was sung and the ceremonial lamp was lighted, andthe finance club was named as FINOMICS. Principal Dr. P.K. Tripathy shared his ideas on the investment climate in India. The main thrust of Mr. Devraj Biswal's address was that along with the focus on youth and smart cities, a plan for smart villages must be initiated and this synchronization will make India a developed country. 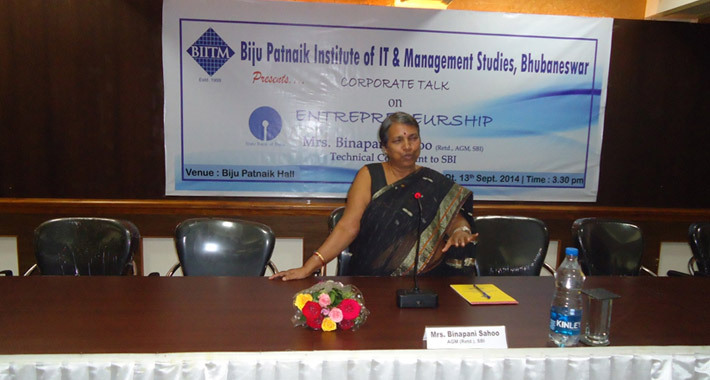 A Corporate talk on "Investor Awareness" by M/s Jyoti Budhia, Derivatives and Technical Analyst, Mumbai was held on 16th of November, 2015 in Biju Pattnaik Institute of IT and Management studies (BIITM). M/S Budhia initiated the session speaking about the Stock Market, describing it as a place where shares are traded. She threw light on the importance of money in today’s fast growing competitive environment and its utilization in the right way. She further spoke about the distinction between Investment and Savings. 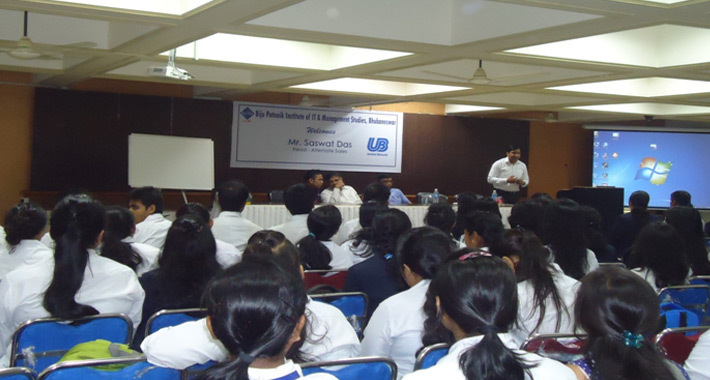 A corporate talk on "Management Education for a Better Future" was held by Ms. Sushree Lipsita Tripathy, Executive Asst. to VP (DICV) &MD (Daimler Buses India), in Biju Patnaik Institute of IT and Management studies (BIITM) on 13th of November, 2015. She urged upon the students to create networks in their work environment and establish multiple committees and associations in a college to add value to each aspect of an event. She highlighted the importance of industry interaction which could be a reason for knowledge sharing on a wider base. 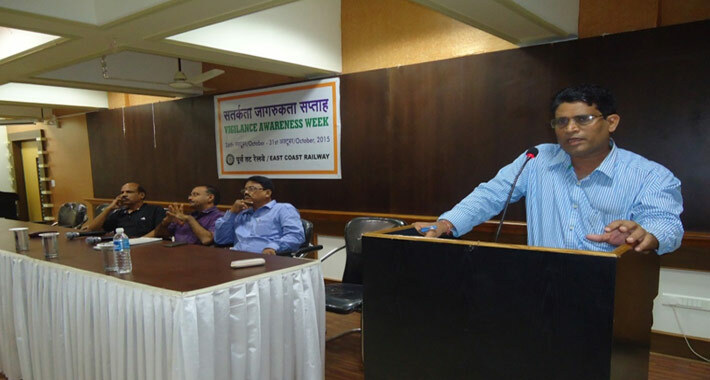 A seminar on "Vigilance Awareness Week" was conducted in Biju Pattnaik Institute of IT and Management Studies (BIITM) in collaboration with East Coast Railways on 31st of October, 2015. The key person Mr. R.K. Patel, the coordinator of the program initiated the discussion by the causes of corruption like lack of proper education, awareness, resources, equitability. Mr. Routray, Chief Vigilance officer of EC Railways said that corruption can be co-operative or forced. Mr. Saswat Das, Head- Alternate Sales, United Biscuits started his interaction with MBA final year students by enlightening about emerging trends in India especially in Nepal and Bhutan because of increasing population, huge resources, and trade development. He propelled light on conventional and modern system of marketing (Barter and Kirana stores). He further highlighted the cash flow problems of the organized stores. Mr. Saswat educated the students with the knowledge of CSD ( Canteen Stores Department), which belonged to Indian Army, Navy and Air Force, which is considered to be another channel all together, with a business of 12000 crores, where people work on 3rd pay roll, He further mentioned about CPC (Central Police Canteen), with 2372 crore business. Mr. Das emphasized the emerging trend of Social Media, Facebook which provides Paid Services of all types. He cited the importance of SMS, E- mails, and E-commerce, Indian Railways which helps in reaching the defined customers. He furthermore whispered about OOH (Out Of the Home) which benefits lot many companies like HUL. Mr. Saswat Das concluded with inspiring the students to undertake a few live projects. 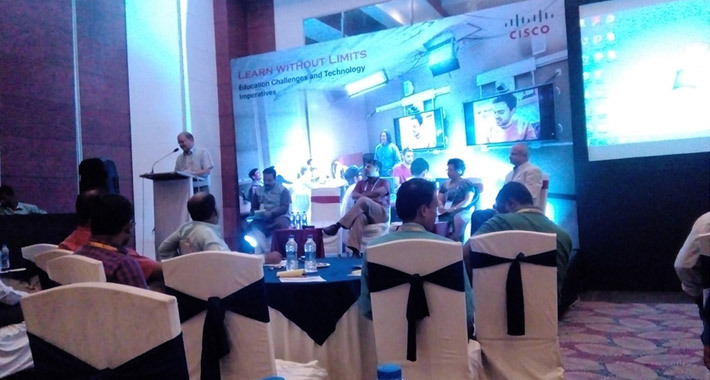 Prof. Biplab Biswal (Dean), BIITM contributed as a Panel Associate in the Knowledgeable Debate on the theme "Education Challenges and technology Imperative" organized by CISCO at Hotel Hindustan International, Bhubaneswar. 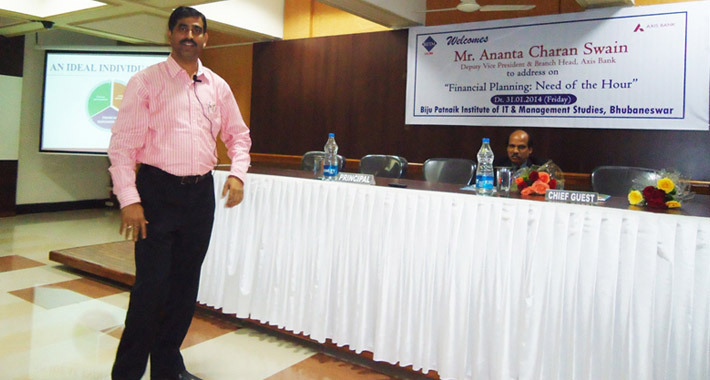 Mr. Ananta Charan Swain, Deputy Vice President and Branch Head, Axis Bank was addressing on the topic "Financial Planning : Need of the Hour". He believed that Financial planning is a continuous process that requires two parties - an investor (individual or a family) and a financial planner. Both the parties need to work collectively and determine the best course of action. 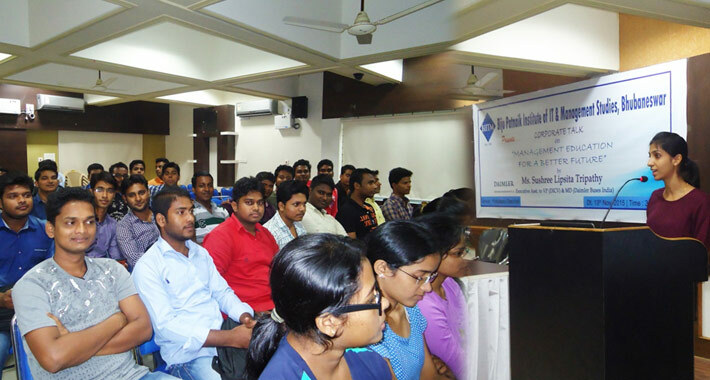 He advised to the students to become a good financial planner by a professional approach and stimulates confidence as well as to possess the technical skills that allow themselves to read the cues, analyse the numbers, leverage professional insights and pre-empt the trends in the economy for providing timely solutions. 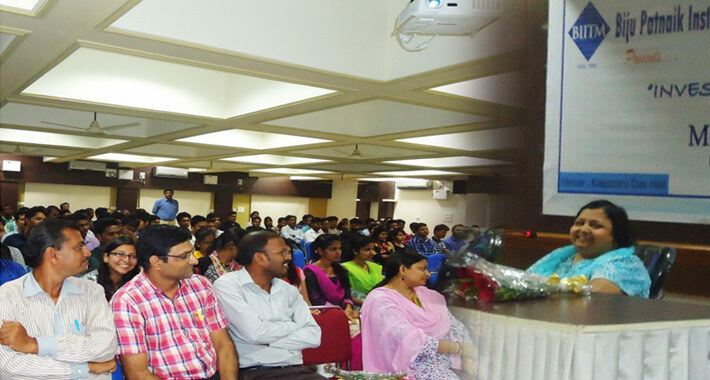 Ms. Priya Siqureira Mohapatra, GM, Corporate Social Responsibility, TCS addressed the students on "Sustainable Development and Growth in Business: A Strategic Challenge". She concentrated on rates of economic growth around the world with greater volatility, which made difficult for companies to create and execute new growth strategies. 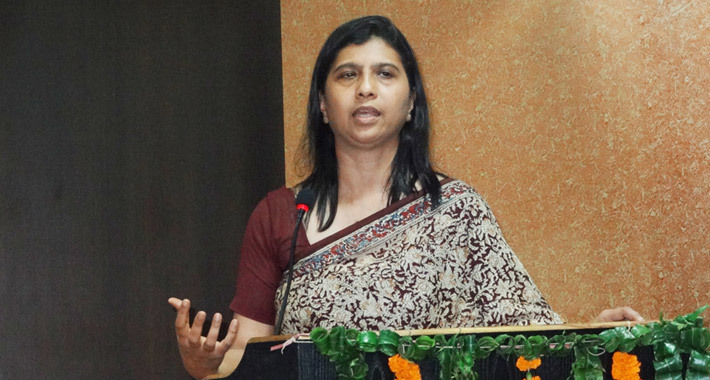 In this connection she has stated the contribution of TCS towards Corporate Social Responsibility which has impact through empowerment, where empowerment is a process of strengthening the future today. Mrs. Binanpani Sahoo (Rertd. AGM, SBI) who is presently serving as a Technical consultant to SBI had delivered a talk on "Entrepreneurship" and encouraged students to predict their future, accept the challenges, keep doing hard work and celebrate the success.